Cellular senescence has been associated with tau protein tangles that are a hallmark of brain diseases, including Alzheimer’s and traumatic brain injury. 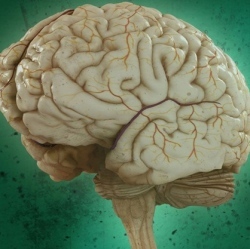 Researchers identified senescent cells in postmortem brain tissue from Alzheimer’s patients and then found them in postmortem tissue from progressive supranuclear palsy. The team confirmed the discovery in four types of mice that model Alzheimer’s disease. The researchers then used a combination of drugs to clear senescent cells from the brains of middle-aged Alzheimer’s mice. The drugs are dasatinib, a chemotherapy medication that is U.S. Food and Drug Administration-approved to treat leukemia, and quercetin, a natural flavonoid compound found in fruits, vegetables and some beverages such as tea. “The fact we were able to treat very old mice and see improvement gives us hope that this treatment might work in human patients even after they exhibit symptoms of a brain disease,” said Nicolas Musi, M.D., study first author, who is Professor of Medicine and Director of the Sam and Ann Barshop Institute at UT Health San Antonio. He also directs the VA-sponsored Geriatric Research, Education and Clinical Center (GRECC) in the South Texas Veterans Health Care System. Typically, in testing an intervention in Alzheimer’s mice, the therapy only works if mice are treated before the disease starts, Dr. Musi said. In Alzheimer’s disease, patient brain tissue accumulates tau protein tangles as well as another protein deposit called amyloid beta plaques. The team found that tau accumulation was responsible for cell senescence. Researchers compared Alzheimer’s mice that had only tau tangles with mice that had only amyloid beta plaques. Senescence was identified only in the mice with tau tangles. In other studies to confirm this, reducing tau genetically also reduced senescence. The reverse also held true. Increasing tau genetically increased senescence. Importantly, the drug combination reduced not only cell senescence but also tau tangles in the Alzheimer’s mice. This is a drug treatment that does not specifically target tau, but it effectively reduced the tangle pathology, Dr. Orr said. The drugs specifically target–and therefore only kill–the senescent cells. Because the drugs have a short half-life, they are cleared quickly by the body and no side effects were observed. Dosage and frequency in humans would need to be determined in clinical trials, she said. Next, the researchers will study whether cell senescence is present in traumatic brain injury. TBI is a brain injury that develops tau protein accumulation and is a significant cause of disability in both military and non-military settings, Dr. Orr said.